I don't often like to admit I am a weenie. In fact, if you knew me, you mgith think I am tougher than I actually am. However, when it comes to opening cans and bottles I often am asking for help and admitting I am not as tough as I think I am. Now, there is a new product available that makes my life easier, and saves my ego in many cases. The Magic Opener is perfect for me around my kitchen! I also know, being an nurse, that as one ages they have a harder and harder time opening simple things like a bottle of water or a poptop soup can. Their hands just do not work they way they once did and they begin to suffer from weakness. In these cases a product like the Magic Opener would be perfect! IT WILL OPEN YOUR BOTTLE OF WATER, GUARANTEED! Just place it and rotate it! Opening all kinds of bottles and tops has never been easier. 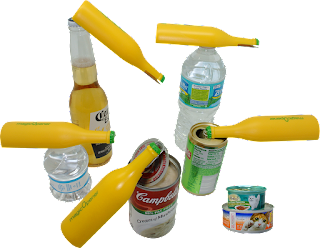 It opens so many different sizes of plastic tops as well as the regular aluminum cans and glass bottles. If this product does not work for you within 90 days, and have you opening your bottles and cans, you will get your money back GUARANTEED! Check it out! I know it will help you out in the kitchen like it did me! I must have a look to see if there is a product like this in the UK! that's different and kind of cute.